We referred earlier to thigmonasty or vibration sense in plants. Plants also have thigmotropy or a sense of mechanical disturbance. The leaves of some plants, such as some mimosa or the venus fly trap, close when touched, in the same way that they close when sensing vibration. Roots often exhibit negative thigmotropy by turning away from objects in the soil that they touch as they grow. Perhaps the best example of thigmotropy in plants is the manner in which tendrils curl around objects. When they come into sustained contact with an object, the opposite side of the stem begins to grow more rapidly, thus elongating relative to the contact side. 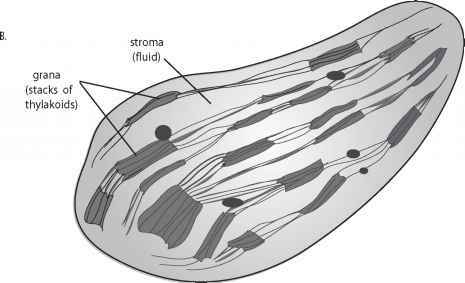 At the same time, the contact cells lose their turgor pressure and become flaccid and smaller. Sustained differential growth and turgid pressure cause the tendril to curl around the object it is touching. How the touch stimulus is communicated throughout the plant is not known and may work differently in different plants. Biochemically, mechanical stimulation has been found to elicit the release of alamethicin, jasmonic acid, and 12-oxo-phytodienoic acid, which induce coiling in some plants. Alamethicin is a peptide that forms voltage-gated ion channels and elicits the synthesis of a number of volatile compounds. 12-oxo-phytodienoic acid is a powerful inhibitor of growth and is differentially found on the contact side of a tendril (Engelberth et al. 2000); if the contact side slows its growth but the outer side continues to grow, the tendril will curl around the contacted object. Plants growing in conditions of sustained exposure to touch, wind, water spray, and other similar physical stimuli are shorter and stockier than plants grown without exposure to these stimuli. This is called thigmomorphogenesis. At least four touch-induced (TCH) genes are known in Arabidopsis thaliana; they belong to a family related to Calmodulin genes, which code for calcium-binding proteins.TCH mRNAs accumulate rapidly on touch, within 10 minutes (Johnson et al. 1998), but the pathway by which these genes induce thigmomorphogenesis is not understood. As discussed in Chapter 12, many sensory receptors are located in the skin: mechanoreceptors that sense touch, pressure, vibration, and hair displacement; ther-moreceptors that sense temperature; and nociceptors for damage and pain. These receptors are not uniformly distributed throughout the skin but instead are concentrated in some areas more than others. Proprioceptors relay information about joint and limb position. The cell bodies for these receptors cluster to form the dorsal root ganglia along the spinal cord. The location of the ganglia provides a relative positional map of the location of the stimulating signal on the body. The axons of these neurons ascend to the brain in two separate pathways in the spinal cord—one that transmits information about highly localized sensations (fine touch and the proprioceptive system) in the dorsal column medial-lemniscal system and the other system, the inter-neurons in the spinal cord that synapse with receptors of poorly localized sensations, pain and temperature, in the lateral sensory tract of the spinal cord (the anterolateral system). Each of these pathways projects to different areas of the brain. The fast-acting interneurons in the anterolateral system project directly into the thalamus without synapsing first in the brain stem. This is the pathway that is responsible for immediate pain perception after injury.The nerve fibers in this system are myelinated and large to transmit signal rapidly (diameter of the neuron affects the speed of conductance). The prolonged pain of injury is the product of the slower-acting dorsal column medial-lemniscal pathway. This system for perception of touch and propri-oception ascends the spinal cord ipsilaterally (on the side of the spinal cord that corresponds to the side of the body that was touched), and axons synapse in the dorsal column nuclei of the medulla in the brain stem before moving on to the thalamus. The receptors in this pathway are unmyelinated small fibers. 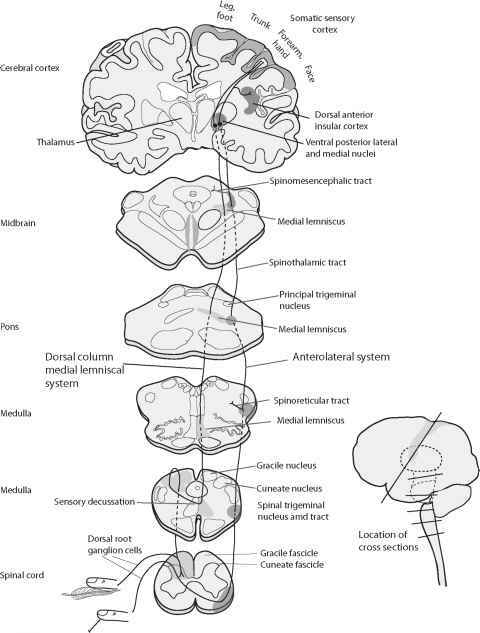 In the dorsal column medial-lemniscal pathway, the first axons to enter the spinal cord, from the sacral (lower back) region, are centrally located in the dorsal column; axons that enter from successively higher areas of the body are progressively more lateral. At the upper region of the spinal cord, the dorsal columns divide into two bundles of axons—the gracile fascicle and the cuneate fascicle. The nerve fibers in these bundles are organized somatotopically—those in the gracile fascicle from the ipsilateral sacral, lumbar, and lower thoracic segments and those in the cuneate fascicle from the upper thoracic and cervical segments. Figure 16-4. Anterolateral and dorsal column medial-lemniscal pathways: touch. Redrawn from (Kandel, Schwartz et al. 2000). humans) less detailed understanding of the source of the sensation. We need to know the location of a cut or contact with flame, not the shape of the thorn or fire. Because the brain stem was the first cerebral ganglion to form in the evolution of the cephalized CNS of vertebrates, most (but not all) sensory axons ascending the spinal cord, even in vertebrates with an extensive forebrain, still make synapses in the brain stem before traveling to higher parts of the brain. Axons from the gracile and cuneate bundles terminate in the gracile nucleus and the cuneate nucleus in the lower medulla. Somatosensory signals from the face and scalp are sent to the principal trigeminal nucleus, which is also in the brain stem. Axons that originate in the dorsal column nuclei decussate, or cross, the midline of the spinal cord and ascend in the medial lemniscus to the ventral posterior thalamic nucleus in the thalamus. As these fibers decussate, the body map becomes its mirror image, and the sacral segments are now located most laterally and the higher segments are located medially. Signals from the face, once they reach the principal trigeminal nucleus, are transmitted in the trigeminal lemniscus, joining axons from the arm and back of the head in the medial lemniscus, to the ventral posterior medial nucleus of the thalamus. The information reaching the thalamus in the right side of the brain comes from the left side of the body and vice versa. In the anterolateral system, the crossover takes place in the spinal cord, whereas in the dorsal column medial-lemniscal system it takes place in the medulla. The decussation always occurs with the first interneu-rons to synapse with the primary sensory neurons (Matthews 2001). From the ventral posterior thalamus, signal is relayed to the cortex. Most neurons from this area project to the primary somatosensory cortex (SI), with a minority projecting to the secondary somatosensory cortex (SII). Again, the body surface is represented in an orderly way. Some areas of the body are overrepresented in the brain with respect to relative body size, however, so that more brain area, for example, is devoted to afferent connections from a human's fingertips or lips than the legs or toes. More cortical area, in fact, is devoted to the palm and fingers than to the leg, trunk, and arm combined. These areas themselves also have a higher density of sensory nerve endings. 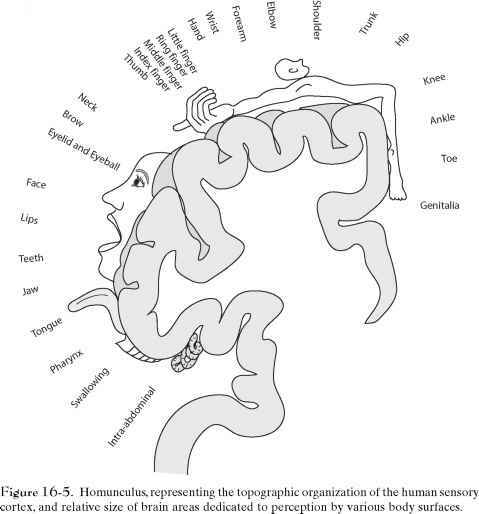 The somatotopic map of the correspondence between skin surface and cortical area was first depicted as a homunculus, a human figure distorted to represent the amount of cortical area devoted to specific body parts, by neurosurgeon Wilder Penfield in the 1950s (see Figure 16-5). He determined, from testing individuals with epilepsy during brain surgery, the areas in the cortex in which afferent connections from different parts of the body terminated. The growth of individual nerves to the periphery of the body innervates the skin in a modular, segmented way, establishing dermatomes or areas on the skin served by branches of a given nerve. Since the branching is developmentally hierarchical, the brain is enabled to recognize regions and subregions in an orderly way. This is something of a different kind of topographic map. Here, relative position in the body is represented, but there is differential distortion based on use or importance. Vision and hearing are not so distorted in this way, although retinal images have different strengths and sensitivities in the center and peripheral regions of the retina. There are also species-specific differences that, at least to some extent, correspond to use and need. In these senses, relative function is preprogrammed into even the brain (and innervation patterns of the body). Like other cortical areas that we have discussed, the somatosensory cortex is laminar. Again, axons of afferents coming from the ventral posterior thalamus synapse with the stellate interneuron cells of layer IV, which in turn connect with the pyramidal neurons of the other layers of the cortex, including motor regions, and back to the thalamus in a feedback loop that supplies sensory information to the cortex. The motor regions of the brain can then act on proprioceptive information or cues about the body's contact with the environment. Sensory modalities are separated in SI into four distinct functional areas, each of which contains its own representation of the whole body. Two of these areas respond primarily to deep pressure and movement, and the other two respond primarily to surface touch. Some neurons from these areas project to the secondary somatosen-sory cortex. Both the primary and secondary somatosensory cortical areas are organized in columns as well as layers, just as are the visual and auditory areas of the cortex. Neurons in each column respond to stimulation from a specific region of the body, and there is extensive interconnection between the four areas. This manner of morphological organization allows the somatosensory system to function via both parallel and hierarchical processing, again as with other areas of the brain. The somatosensory cortex not only enables perception of touch and temperature but also is responsible for localization of the source and intensity of a stimulus, as well as further dissection of somatosensory signals. The secondary somatosensory cortex is innervated by neurons from SI. SII requires projections from SI to function. Neurons in SII project to the insular cortex, which in turn relays signal to por tions of the temporal lobe thought to be involved in creating and storing tactile memory. Areas in the posterior parietal cortex receive input from SI and other areas and are involved in integrating tactile signals with proprioceptive signals and with integrating information from the two hands. Other areas integrate visual with somatosensory information and initiate sensing and movement as a response to tactile and proprioceptive information (Kandel, Schwartz et al. 2000). A much-studied example of topographic mapping of a somatosensory system is that of vibrissae, or whiskers, in rodents. The vibrissae are the principle tactile receptors in these animals. They form along a line by a repetitive periodic patterning process that generates them one by one, roman-candle fashion along the line. The number is generally invariant in the mouse (Dun and Fraser 1959), although artificial selection experiments and some naturally occurring mutation (in the Ta, or Tabby gene) can expose underlying variation. This is thought to be a cell-surface ligand gene product whose extracellular domain is a ligand for a TNF-class cytokine receptor (related to IL1 and NFkB pathways we have seen earlier), and is used in epithelial-mesenchymal patterning of structures like hair and teeth. As the developing face projects outward, presumably each new vibrissal pri-mordium produces its sensory and transmitting neurological elements when the vibrissa is initiated. As it develops, each whisker maps to a specific site in layer IV of the rodent primary somatosensory cortex. The somatotopic map represents precisely the position of each whisker on the rodent snout. A single whisker is innervated by about 100 neurons, which convey the directional movements of the whiskers to the brain. The afferents project from the whiskers to the SI through the thalamus. In the SI, the neurons are arranged in functional units called barrels, one per whisker, corresponding to the array of the whiskers on the snout (see Figure 16-6). (The nomenclature is due to the shape of the cell bodies of these neurons because they appear to form barrel-shaped arrays when the cortex is cut parallel to the cortical surface.) As in other synaptic networks in the brain, there is a critical developmental period for the growth of the optimal network of connections among barrels in the cortex of the rat. When vibrissae are removed from a young rat at an early age, the cortical connections to the different cortical layers are much less dense than in normal rats, suggesting that experience "trains" the synapses (Fox 1994). Interestingly, not all species that have whiskers have corresponding cortical barrels. Barrels can be found in, for example, the mouse, rat, squirrel, porcupine, and walrus but not in the dog, cat, or raccoon. In addition, barrels are found in some animals that have minimal use for their whiskers, such as the guinea pig and chinchilla (Nieuwenhuys et al. 1998). However our understanding of the brain is still incomplete if not perhaps only rudimentary, so caution is needed in generalizations about brain structure and function. Figure 16-6. Topographic map of mouse vibrissae. (A) Vibrissae; (B) corresponding spatial organization of barrels in the cerebral cortex. Reprinted with kind permission of T. A. Woolsey, originally published in (Woolsey and Van der Loos 1970). nosed mole. The snout of this animal extends in a splayed protrusion of 22 fingerlike appendages that are used to explore the animal's immediate surroundings. This is shown in Figure 16-7. Despite its location, the organ is not olfactory, nor used for manipulating food or other objects, but instead for touch. The appendages are covered with tiny Eimer's organs, hairlike touch receptors, 1,000 or so on each of the 22 rays of the star. More than 100,000 nerves project from the nose to the brain, compared with the 17,000 or so from the human hand (Catania 1999). When the nose comes into contact with an object, it engorges with blood, and this pushes the receptors closer to the surface of the nose, thereby increasing its sensitivity. This provides a kind of light-less spatial representation of the environment in front of this burrowing animal, a kind of tactile retina, whose spatial aspect is vital to interpretation. Does the star-nose mole "see" its environment or just "feel" it? Given what we know about the organization of the somatosensory areas of the cortex vis-à-vis touch sensitivity, it is not surprising that the star-nose is highly over-represented in this animal's brain. The star is represented three times by a stripe of tissue in the cortex of each hemisphere, once in the SI, again in the SII, and yet again as a smaller representation in an area termed SIII (Catania and Kaas 2001). This is unusual; the somatotopic map of vibrissae, for example, is represented only once, in SI. The amount of cortical surface devoted to the star-nose reflects the importance of this tactile organ to the mole. Furthermore, it is possible that distributing the cortical connections among three small areas rather than one large one may speed interneural connections, and this could be important for an organ upon which an animal relies so heavily. When the spinal, medial, and trigeminal lemniscus join? Where is the medial lemniscus derived from?